Preheat oven to 350. Melt butter in a large skillet. Once butter is melted, add the finely diced onions. Cook until onions become translucent - 8 to 10 minutes. Add dijon mustard, worcestershire sauce, poppy seeds, and hot sauce. Stir and simmer for 3 to 5 minutes. Meanwhile, slice rolls in half without separating the individual rolls. 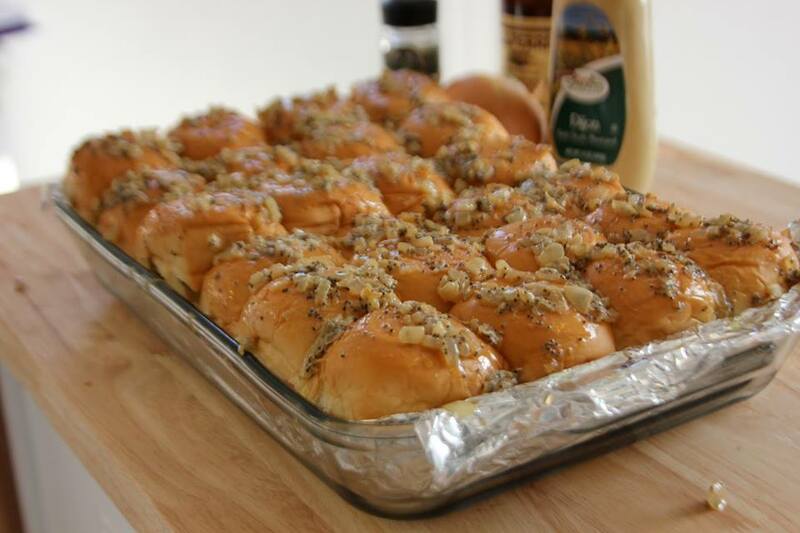 Line a baking pan with foil and place bottom half of rolls in the pan. Once onion mixture is done, spread 2/3 of onion mixture over the bottom half of the rolls. Maxing sure to get an even layer. Then layer ham over the onion mixture and finally cheese on top of the ham. Top with the roll tops. Spread remaining onion mixture over top of rolls. Cover with aluminum foil. You can make these ahead and and refrigerate until ready to bake. Bake covered at 350 for 20 minutes. Remove foil briefly at the end to get a nice golden color on the sandwiches.